This weekend I read through the latest World Silver Survey, published by The Silver Institute. For those unfamiliar with these reports, they are published on an annual basis and are very well written. At about 100 pages in length, the document is definitely not a quick read, but you can pick and choose areas of interest, it isn’t necessary to read every table and sub-heading. You can find all the World Silver Surveys (from 1950 to date) at https://www.silverinstitute.org/all-world-silver-surveys/. Ironically, Gold is also undervalued at the moment. It climbed strongly during the first decade of this millennium, but then became stuck. Today it is still possible to pick up gold at 2013 prices, an absolute bargain. (See chart below). 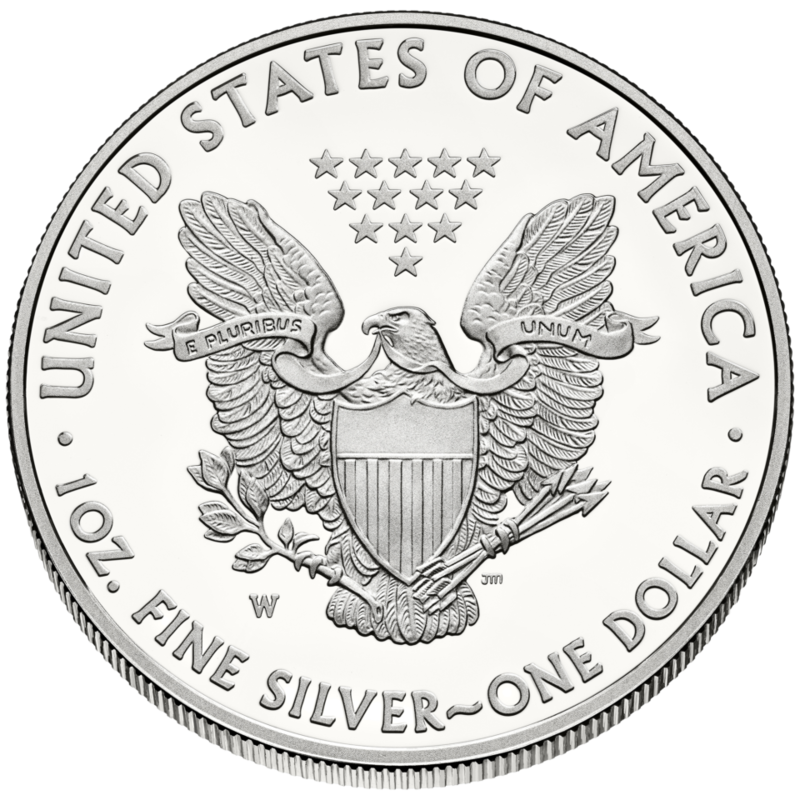 If Silver is undervalued relative to Gold, and if Gold is undervalued in general, then that makes Silver a VERY attractive investment! If you read the World Silver Survey report you will see that Silver extraction appears to have peaked. It’s hard to say if this is absolutely true or not, because demand drives supply and demand has a slight year-on-year volatility to it. However, further research into precious metals will show you that most of the easily extracted deposits and the larger deposits have already been mined. If we want to continue producing precious metals at current rates, then we will have to look beyond traditional mining methods. Mining will have to take place deeper or out at sea. Recovery of used metals will increase in scale. These methods will work, BUT they cost more money. With the cost of precious metal production rising, so the cost of the metals themselves will rise. Miners won’t mine if it’s not worthwhile. That will lead to scarcity, which will drive prices up until the miners do mine. Steadily increasing prices in the long-term precious metals market are virtually guaranteed. 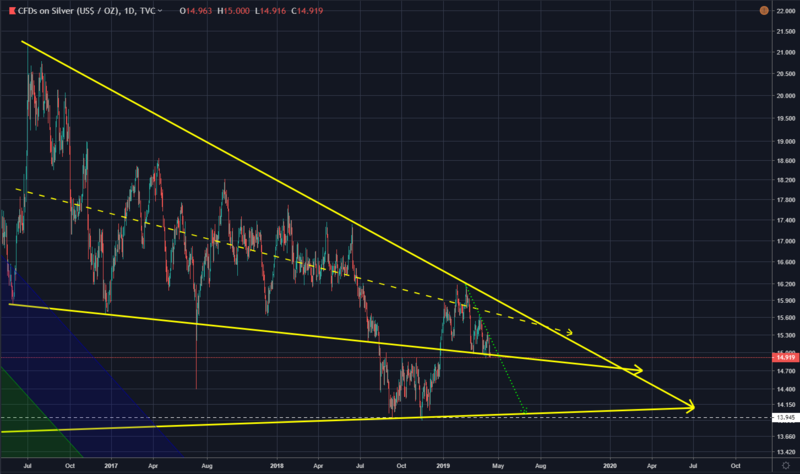 Silver looks to be breaking downwards through local support. The break is not confirmed and it may still become a late bounce. At this stage I give 60% probability to a downwards movement and 40% to an upwards one. Local support was broken in the latter half of 2018. This may be a repeat of such an event. In 2018 the long-term support stopped the price drop. I expect that to happen again. The chart below gives an overview of the current price movement. 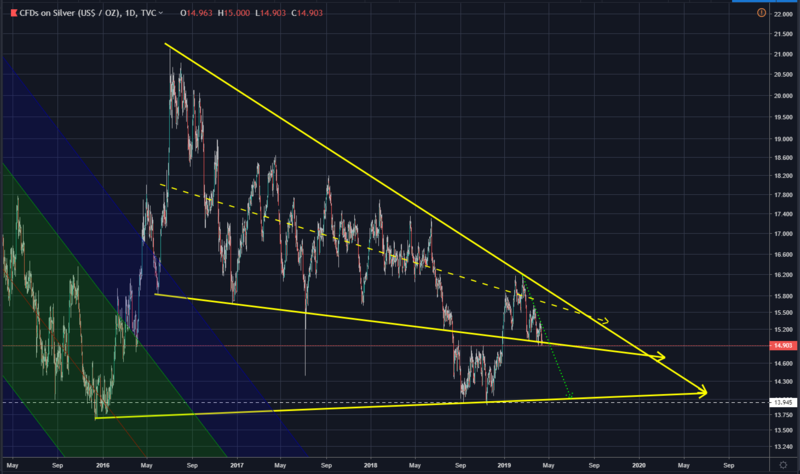 Silver is in a converging triangle – moving towards a breakout. I consider such a breakout (a positive one) to be likely in late 2019 or very early 2020. The dashed line is the general price movement. The fine dotted line is the upper limit of the local downtrend. 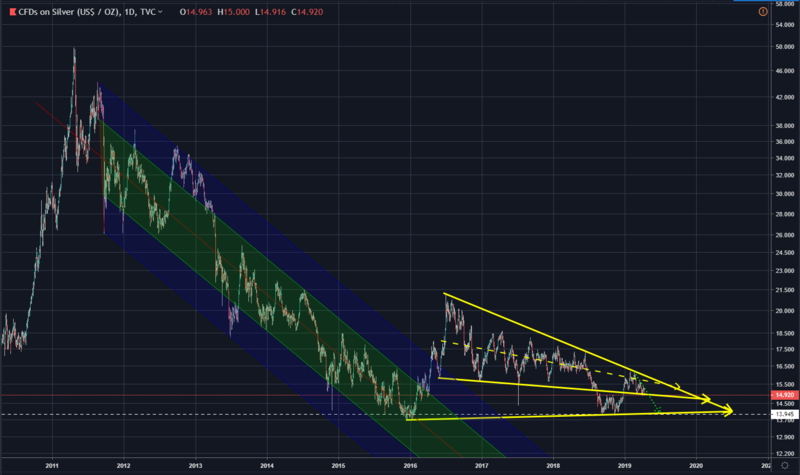 In the bigger picture you can see how this converging triangle broke out of the declining Silver price channel experienced from 2011 to 2016. 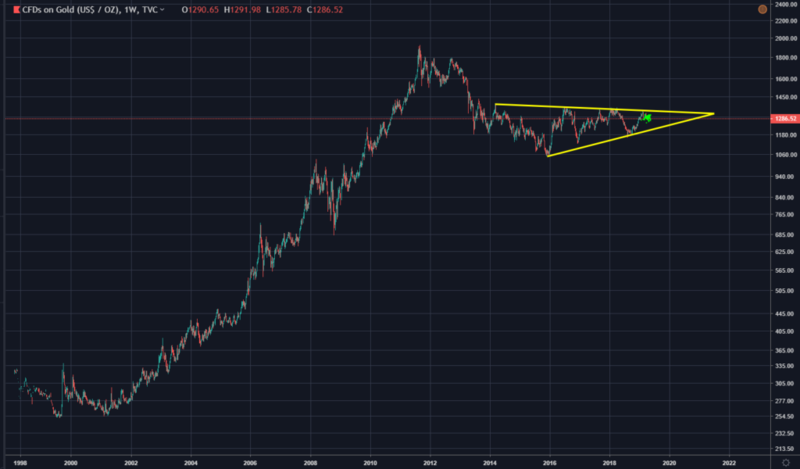 Looking at an even longer-term chart, we can see that Silver price is trending upwards, but that it has spent the last decade going downwards and sideways. 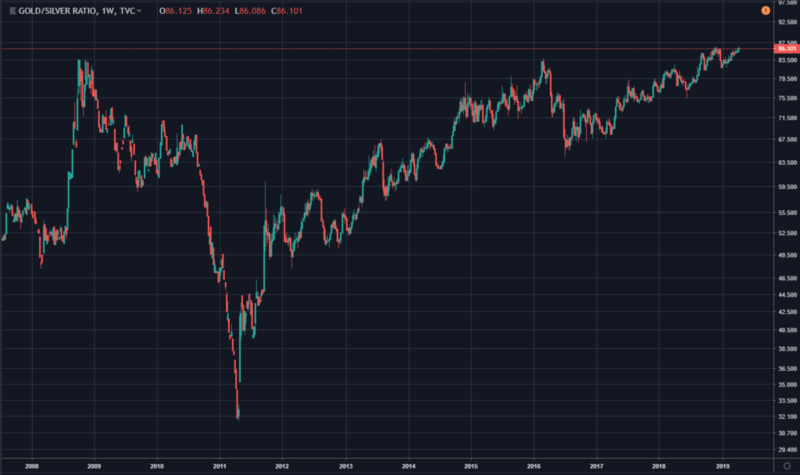 For this reason, and those stated earlier, it is now highly likely that Silver will begin to climb rapidly in price in the not-too-distant future. In the interests of transparency I must tell you that I took a position in silver earlier this year. No, I’m not trying to shill my holdings here (I WISH I had that sort of effect on global markets! 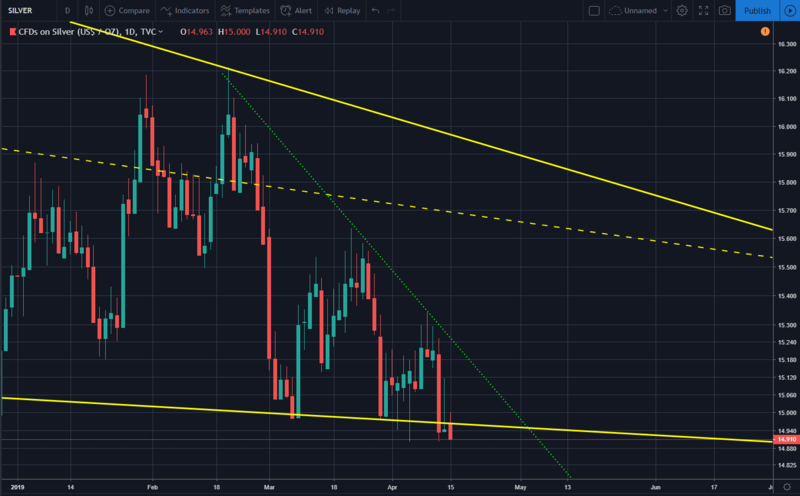 ), I’m only showing you that I believe that this is a good time to buy, especially if Silver does now dip below local support (which is sitting at around $14.90). Don’t wait too long if you want to buy. 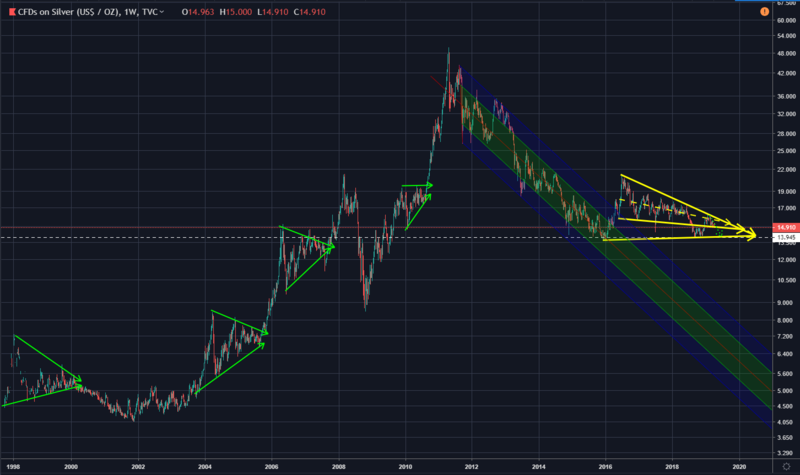 Long-term support resides in the $14.00 region, so its not as if Silver has far to fall before hitting the bottom and starting to climb. Though it’s not impossible, I would certainly not count on Silver revisiting that level before breaking out upwards. Indeed an upwards break is already possible and will becoming increasingly likely as we enter into the third and fourth quarters of 2019. I consider anything below $14.00 to be a very good investment. These factors can greatly affect both purchase and sales price. Depending on such factors you may be exempt from taxes like VAT, or you may find yourself having to pay a Capital Gains Tax. Ensure that you know these things before you buy! Also remember to budget for things like storage/safekeeping/insurance when purchasing precious metal. Above all, buy from reputable accredited dealers. There are only two places that I really suggest people put their money right now: cryptocurrencies and precious metals. All charts made by Bit Brain with TradingView.